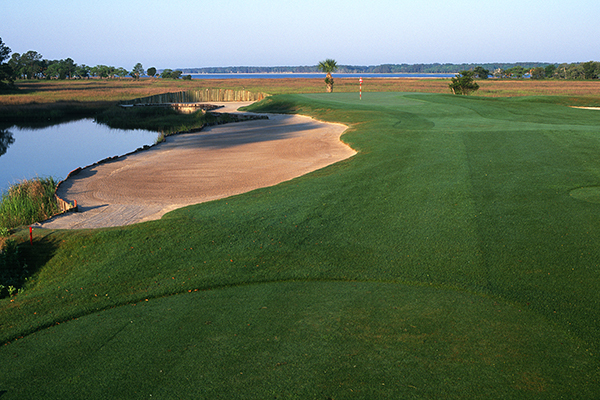 Pete has designed well over 2,000 golf holes in his extraordinary career, but it’s safe to say that the final hole at Harbour Town Golf Links, at the southern terminus of Hilton Head Island, South Carolina, is among the two or three most recognizable in the Dye oeuvre. The choppy waters of Calibogue Sound lurk to the player’s left, waving marsh grasses fronting the tee box wreak havoc with wayward drives, and the candy-striped lighthouse stands sentinel behind the green, a clear target for both drive and approach. It’s an epic conclusion to one of the most beguiling courses in the modern game. Harbour Town has as unique a collection of champions as virtually any PGA Tour venue. Beginning with the first event in 1969, won by Arnold Palmer, the list of winners stack up with virtually any other long-time Tour venue. Tom Watson, Johnny Miller, Jack Nicklaus, Hale Irwin, Bernhard Langer, Fuzzy Zoeller, Nick Faldo, Payne Stewart, Justin Leonard, Nick Price Greg Norman, Davis Love III, Jim Furyk and Matt Kuchar have all triumphed at Harbour Town. The crescendo of the finishing holes, as a player emerges from the forest to sweeping seaside views, gets most of the attention. 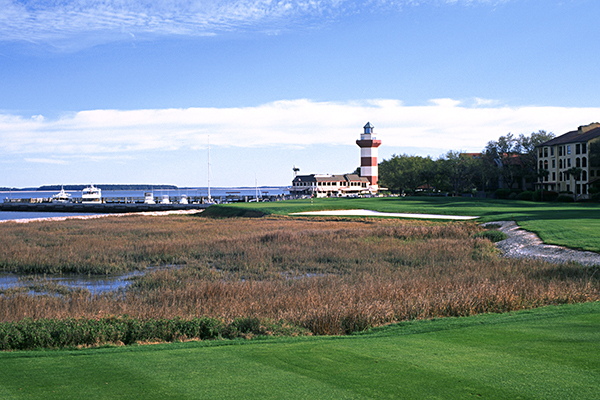 But it’s the understated, inland hole-to-hole genius of this design, admired by and bedeviling to Tour pros and resort duffers both, that maintains Harbour Town’s lofty reputation. Though one of Dye’s more subtle designs, forty-odd years after inception it remains an absolute standout in the golf world. He’s designed well over 2,000 golf holes in his extraordinary career, but it’s safe to say that the final hole at Harbour Town Golf Links, at the southern terminus of Hilton Head Island, South Carolina, is among the two or three most recognizable in the Dye oeuvre. The choppy waters of Calibogue Sound lurk to the player’s left, waving marsh grasses fronting the tee box wreak havoc with wayward drives, and the candy-striped lighthouse stands sentinel behind the green, a clear target for both drive and approach. It’s an epic conclusion to one of the most beguiling courses in the modern game.